David McCreery was born on 16 September 1957 in Belfast, Northern Ireland. He moved over to Old Trafford at the tender age of just fifteen years of age following in the footsteps of other Belfast teenagers George Best and Sammy McIlroy. David McCreery made his Manchester United debut as a substitute on 15 October 1974 against Portsmouth. Like McIlroy before him, he was just seventeen tears old when he took to the pitch at Fratton Park in Division Two. Manager Tommy Docherty was trying to guide United back to the First Division at the first attempt following relegation in the 1973/74 season. Docherty succeeded in his objective and David McCreery's first start for Manchester United came on 19 August 1975 against Birmingham City. It was United's second match back in the top flight of English football and the Reds registered their second consecutive 0-2 away win. McCreery retained his place in the team for the next three matches and scored his first goal for Manchester United on 27 September 1975 against Manchester City at Maine Road. The Belfast teenager made 32 appearances in the 1975/76 season, 19 as a substitute. In the following season McCreery made his greatest number of appearances for United when he featured 37 times - 24 as a substitute. Of his 110 appearances for Manchester United an amazing 53 were as a substitute. He scored eight goals during his Red Devils career. David McCreery's last game for Manchester United was on 16 May 1979 against Chelsea in a 1-1 draw at Old Trafford. Three months later McCreery was sold to QPR for a transfer fee of £200,000. While David McCreery was a Manchester United player he played in two FA Cup finals, in 1976 and 1977. On both occasions he came on as a substitute for winger Gordon 'Merlin' Hill. The 1976 final was a loss to Southampton but David won his one and only major honour with Manchester United as the Red Devils beat Liverpool FC 2-1 in the following year. David McCreery made his international debut for Northern Ireland on 8 May 1976 against Scotland in the British Home Championships. McCreery came on as a substitute at Windsor Park in a 0-3 loss to the Scots. He went on to make 67 appearances for his country, 12 as substitute and no goals scored. Remarkably for such a small nation Northern Ireland appeared in two consecutive World Cup finals in 1982 and 1986, and David McCreery played in every match at both World Cups. The highlight for McCreery was when he helped the Irish to defeat the host nation, Spain, in the 1982 World Cup. 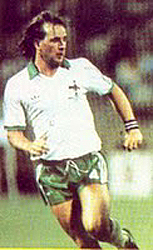 McCreery played his last match for Northern Ireland on 18 May 1990 in a friendly against Uruguay.